A new, European-designed fire helmet. 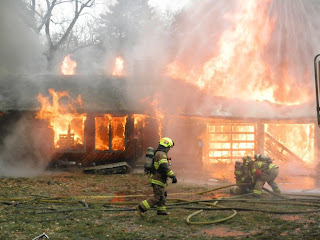 It is not uncommon to hear the phrase, “The American fire service is 200 years of tradition not impeded by progress.” The line normally brings a few chuckles and nods of affirmation. 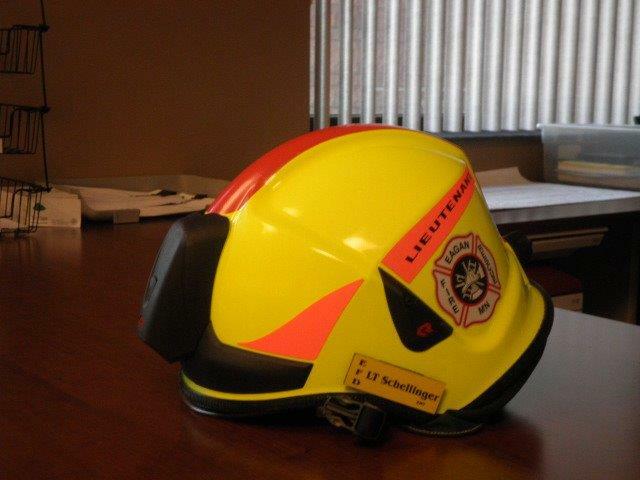 One example and symbol of that tradition has been the firefighters’ helmet. Historically it has had the long brim in back and usually a high crown in front, often with a leather shield or emblem to identify the firefighter, station, or unit number. Recently, a few Minnesota fire departments have started to transition to a “European-designed” fire helmet that is similar to a motorcycle helmet. 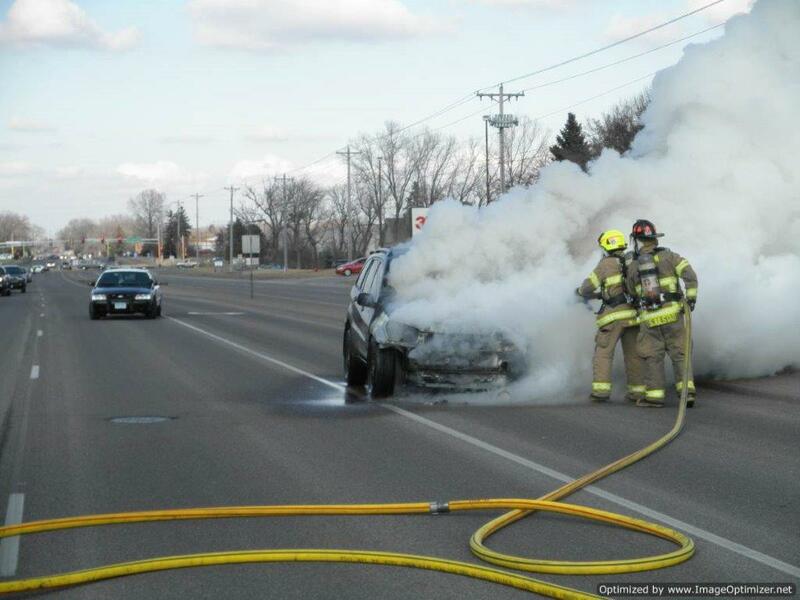 White Bear Fire Chief Tim Vadnais said he had noticed his firefighters taking off their helmets when working at the scene of car accidents: “The helmet was in the way when they needed to get into the car to care for the victim and during extrication,” he said. The new helmets perform better at highway scenes. But on the highway, working in traffic in a wrecked car was not the time to be taking off their helmets, the chief said. Vadnais said the new helmets are more balanced, more comfortable, and provide added safety for the firefighter’s head and eyes. The helmet has two built-in face shields that can be pulled down for protection. White Bear has 25 of these helmets in service and is about to place an order for more. 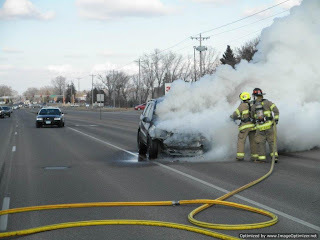 Eagan Fire Chief Mike Scott was likewise concerned that their traditional helmets were being removed at highway scenes. The Eagan department had also seen their traditional helmets as a detriment while performing their self-rescue drills. The helmet would get caught in the sheetrock and wiring as the firefighters broke through walls while training on this critical lifesaving skill in the “tangle maze” prop. The helmets have two face shields to protect firefighters. The new helmet is smooth and round, and “goes right through.” Eagan now has 30 of the helmets in service and is planning on ordering more. Most of the firefighters love them, he said. They come in a range of colors, and include an option for an LED light on the front of the helmet. Chief Scott said in addition to providing light, they allow firefighters to locate each other even in heavy smoke. I guess not all firehouse traditions are changing. The general assembly listens to Fire Chief Nyle Zikmund. 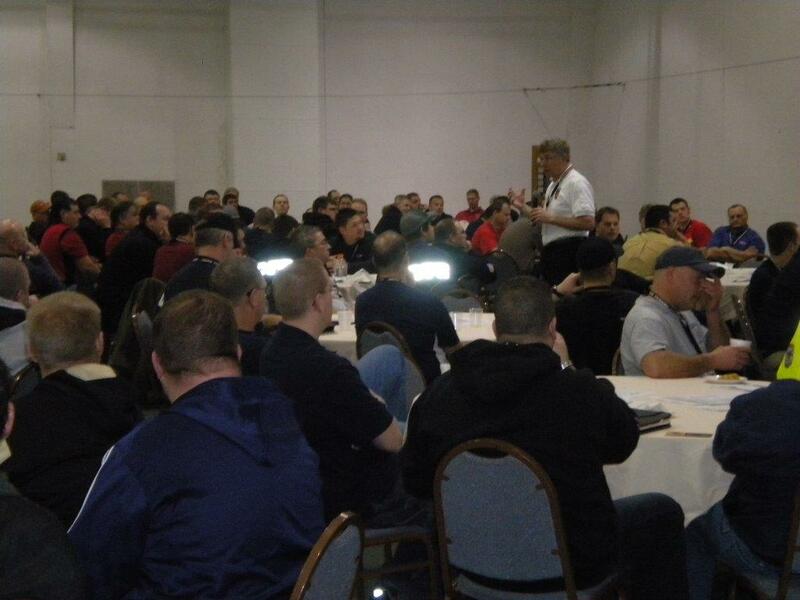 On a recent snowy weekend, 211 firefighters from around the state gathered at the Arrowwood Resort in Alexandria for the Minnesota State Fire Chief’s Association Fire Officer School. By 8 a.m. on Saturday, the place was buzzing. The general session had started, announcements were made, and students and instructors were quickly connected and headed to their classrooms. The school, now in its second year, offered ten tracks of education. Walking down the hallway, I could hear Chief Seal from Bloomington saying, “Watch what happens when this window is taken out.” A packed room of firefighters watched the video of a structure fire and observed how the fire changed with the increased ventilation resulting from the broken window. Chief Seal’s presentation, “The First Five Minutes,” had their full attention. Around the corner, the next classroom was noisy as firefighters worked in teams to manage multiple emergency scenes using a simulated city and “toy firetrucks.” The class focused on the critical operational decision-making that occurs on the fire ground. The school offered classes in leadership and management, fire service management, special responses, wildfire training, customer service, and a certification review and testing. There was also a track on the operations and resources of the State Fire Marshal’s Office. I presented one of numerous modules in a class entitled “The New Fire Officers Primer.” The class was facilitated by Bruce West, and there was no downtime. 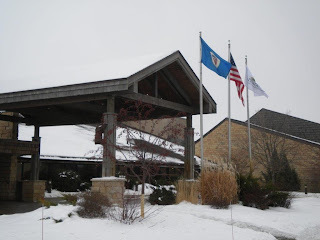 The Arrowwood Resort in Alexandria hosted the training. Many of the firefighters brought their families with them. Once classes started, the spouses and kids headed to the indoor water park, the ice rink, sliding hill, fitness center, and the spa. The Tennis Center had been converted to accommodate the large assemblies and contained a vendor area and even a “Sparky the Fire Dog” jumping house for the kids. Congratulations to the Minnesota State Fire Chiefs’ Association, Mark Hovland from Fergus Falls, and Bill Thoennes from Alexandria for hosting a very special event. It was high-quality training in a family-friendly environment. Great job, guys!